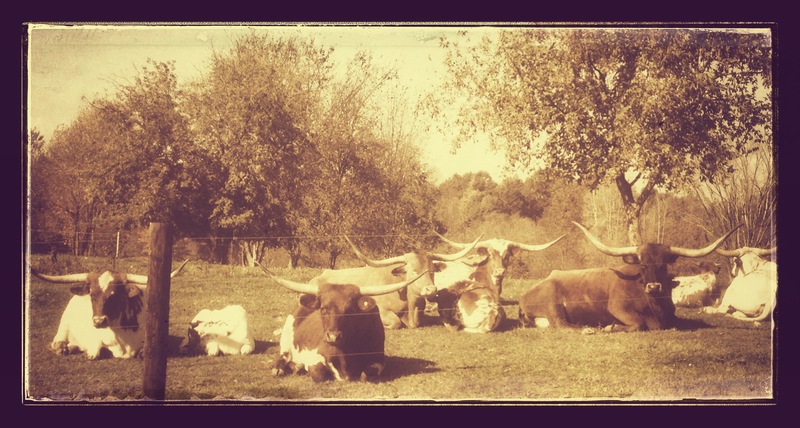 longhorns | Apple pie, anyone? Every year after Mother’s Day, I slip off my wedding rings and tuck them away until fall. Spring and summer on the farm are dirty, sticky months full of soil and planting, clanging metal gates and cattle charging. It is no place for precious metal. Every year, I am struck by the age my hands have gained. They are not my hands. They are my grandmother’s. This is a season of life out here on the farm. There are five sweet robin eggs in the garden birdhouse, bright baby blue. 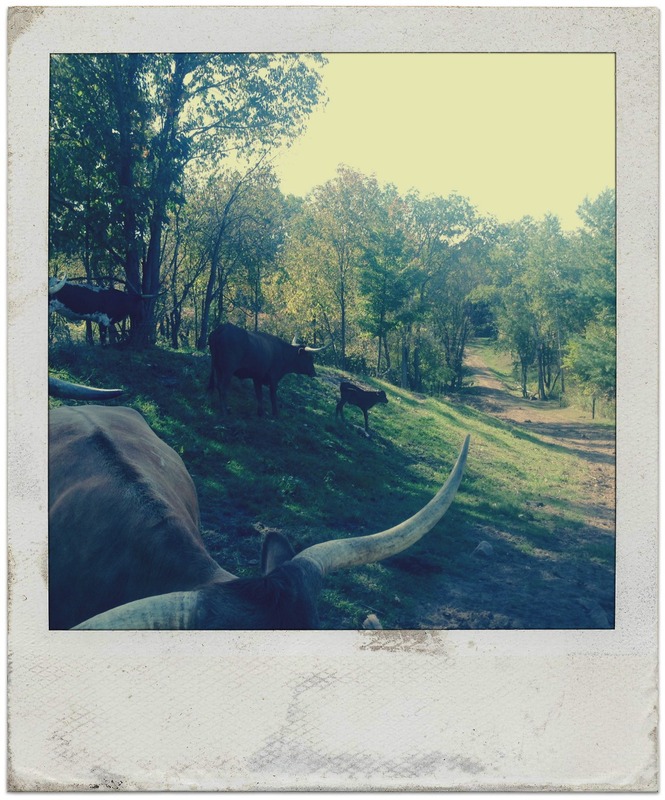 Six new baby longhorns are running through the evening light as I type, daring one to chase the other. The strawberries are flowering and about to bud and tomatoes will be planted this weekend. Two of our best friends welcomed a baby boy into their family this afternoon. New life is everywhere. 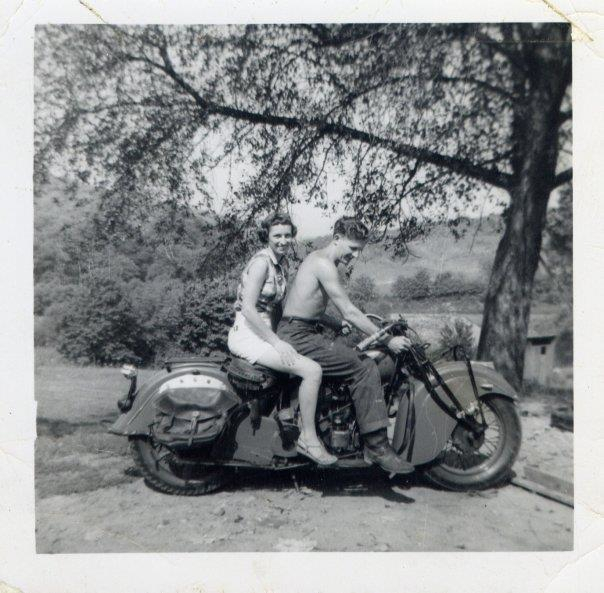 My grandmother is in the final stages of life. A phone call this afternoon confirmed that the very last days are here. My grief is tempered by the understanding that she is going to feel so much better soon… her body has waged war against her for 30 years, crippling her with arthritis. That will end, and I can ask for no greater gift. She left me her arthritis. I see it when I take off my rings and in passing… a flash in the mirror, a certain angle of a photograph. I feel it in my joints and I read it in my medical file. Her story will be mine soon enough. She also gave me her orange fedora and Polish hips. We are that kind of family. I am literally surrounded today by life and death… both are staring at me, sitting on my porch and streaking across the sky. And yet, I forget the enormity. There are library books to return and lunches to make. Gus has attached himself to the van with a bungee cord, and Abby is 3 days short of a nap. I live in the in-between until the phone rings and the extremes make themselves known again. It’s easy to forget the extremes even exist when you are trying to find the twist-tie to the bread. But then again, we can’t live in those extremes. We can visit but we cannot settle. There must be a foundation to steady the life and death, beginnings and ends. There must be somewhere to come home to. 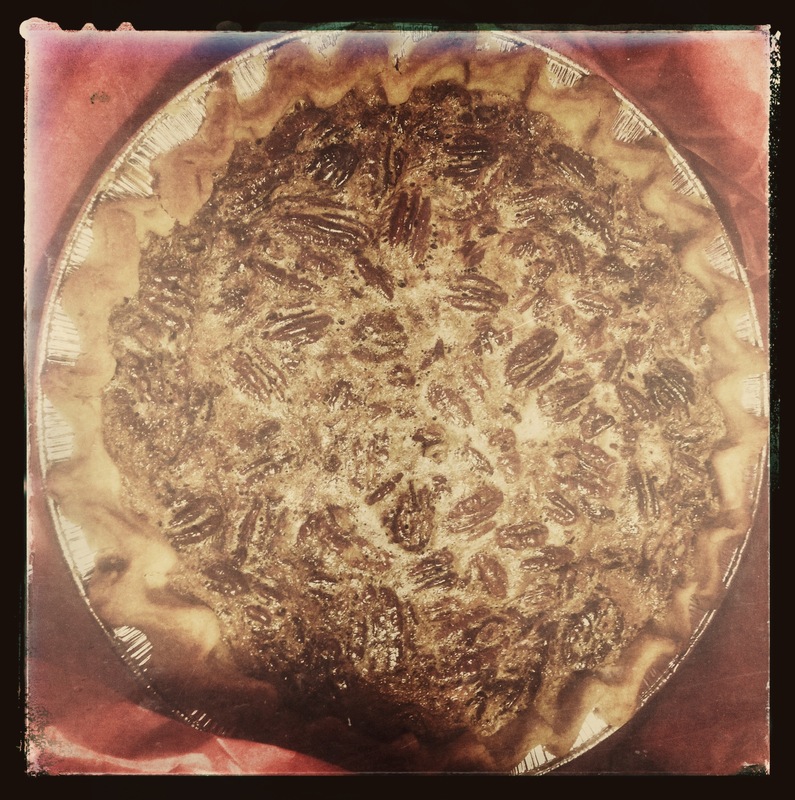 So I will make an apple pie and set the table… like every night. And I will hide my rings and plant new seeds. And I will grieve the end of life and cheer the beautiful new breaths. Because I live in the in-between. THAT is home. Amazing really… how the best days and the worst days and all the days in-between… all the days start with a sunrise and end with a sunset. For you today, as this house nurses stuffy noses and short fuses: a small but extremely accurate window into my marriage. Curt was gone for most of last week, and to add salt to the wound, Mother Nature completely lost her mind while he was away. Six-foot snow drifts changing shape hourly like sand dunes made our road completely unpredictable. 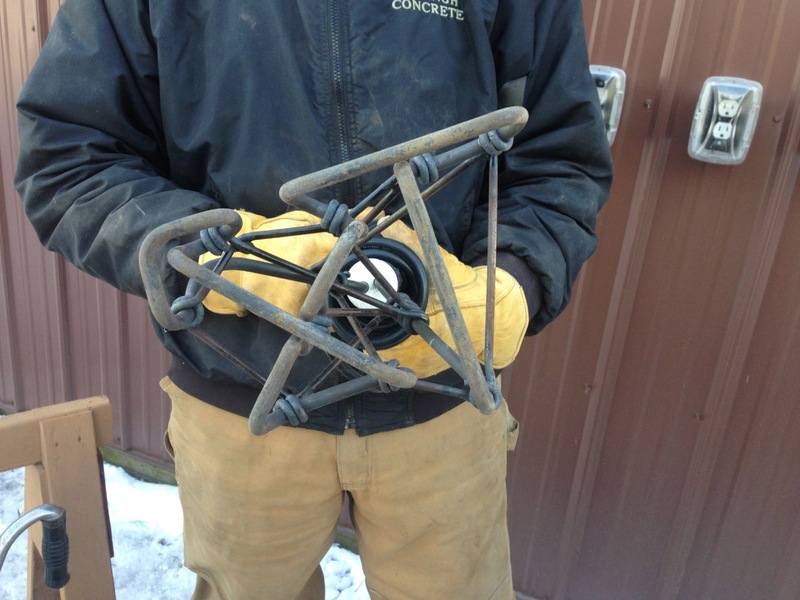 Snow piled up in the pastures and along the fence line covered up the bottom 2 of 5 rungs, effectively raising the ground by 2-feet in some cases. 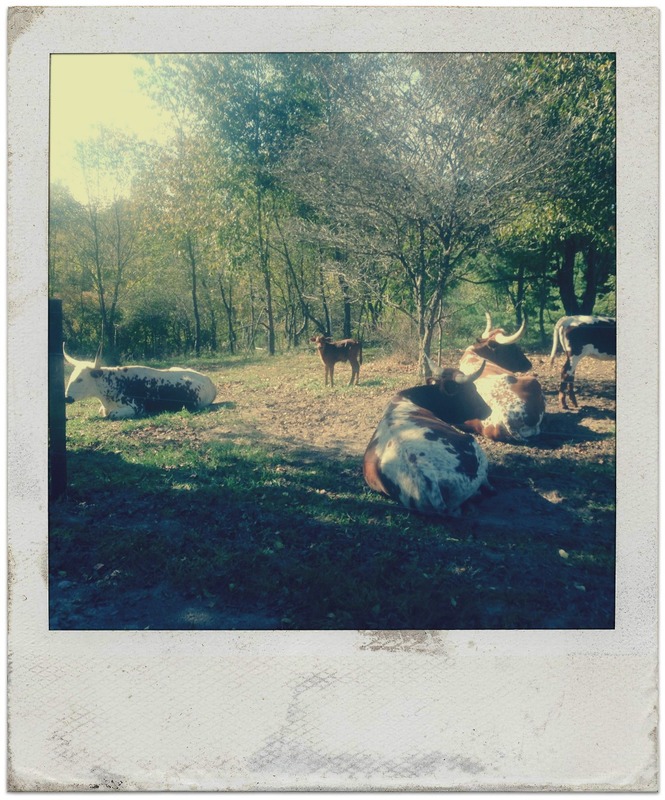 The chickens huddled in their coop to avoid the wind, but the cows had no such luck. Personally, I nearly lost my boots in the back 40 post-holing to the water pump to refill. Like, literally. The snow came up to just above my knees- the last time I had such a serious cardiovascular workout was in college as a sports major. The children asked me why I was breathing so hard. When I told them I was tired from walking outside to check on the animals, Gideon asked me if he needed to call an ambulance. Ahem. Curtis James. The snow is so high. The cows are fine. I fed them. Their water is fine. They’re all happy. I mean, they’re not happy- they’re miserable. They stare at me and I think they are silently cussing at me. The wind is KICKIN’ out there. Today was nice. The sun was amazing. But, Curt… we got SO MUCH snow and the ground is so high now. Those cows can jump over the fence without any problem on a normal day… what if they walk over it now? What if they come up for a drink at the fountain and just keep walking? What if they all get out? I have been trying to figure out a plan in case they bailed on me. I mean, I can’t walk out there in the yard, the snow is so deep… how would I push them back into the gates? How would I even get some of the gates open? They’re iced shut! Who would help me? You were in Colorado! 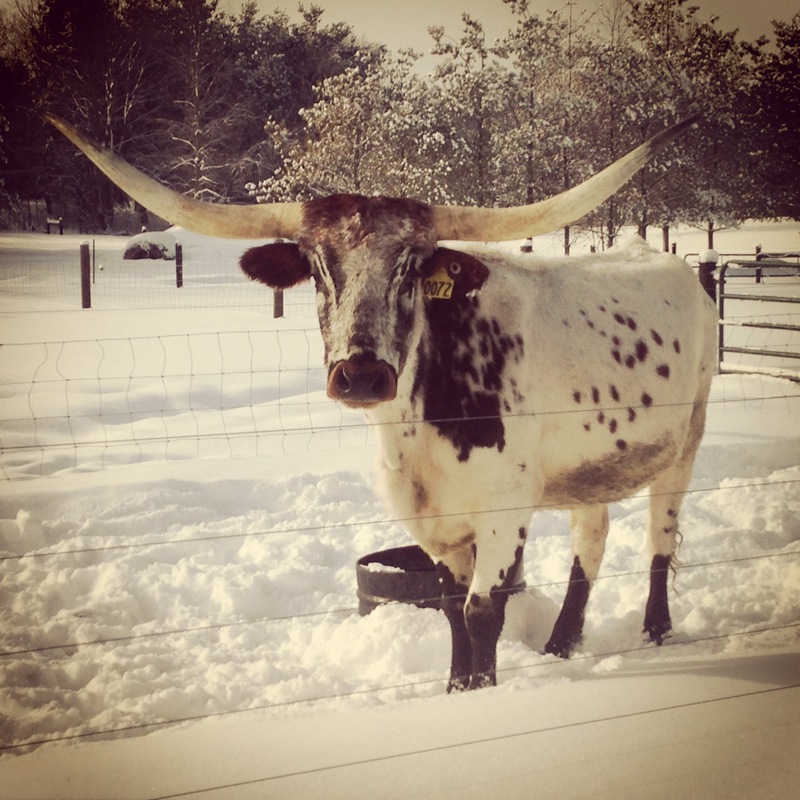 What if the cows slipped on the 2-inches of ice on the driveway? What if they took off down the road again? I would never be able to get them back alone in this kind of weather. I almost died taking the trash out. And if they came back on their own, they’d be so amped up that they’d hurt themselves on the ice. And then what would I do? Call Doug? Call the vet? Oh, man. You saw that you can’t get through to 6 Mile, right? We wouldn’t be able to get the tractor through some of those back fields to surround them and we wouldn’t be able to get up the hill FOR SURE. Lawd, Curt. It’s a little nuts. Everything’s totally fine, but the snow is making me nervous. Curt took off his coat in our bedroom and stared out the window where the yard met the pasture. He sat down quietly on the bed and began to unlace his shoes. The cows won’t jump the outside fence, Kate. There’s no green grass or corn growing to entice them. All their food is inside the fence. I am so glad you’re home. Forgive my unexpected absence last Thursday, Folks. I was ambushed by a plague so mean and nasty I didn’t know what day it was until Saturday. I can stand on my own two feet today, but I am not steady… so watch out. 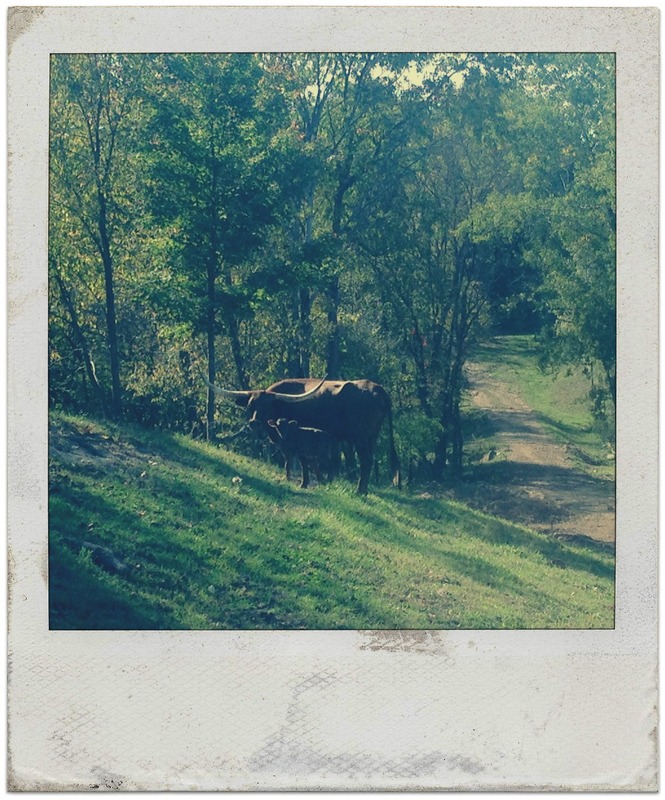 I wanted to give you a poetic tale and testament of the Old West, where the longhorn came from, and how the breed survived extinction by the efforts of seven families, but I will keep it simple today. We’ll just cover the branding process, nice and neat. Branding, like we talked about on the 25th, is simply expressing your message visually. It’s creating a symbol or a look that represents you consistently wherever it’s seen. In today’s world, that’s all about sales and websites and stats. In the Mulder household, branding actually has more to do with cattle than with writing… but still everything to do with ownership, vision, and consistency. Branding animals is proof of genetics, ownerships, and breeding. Before there were fences, there were brands. 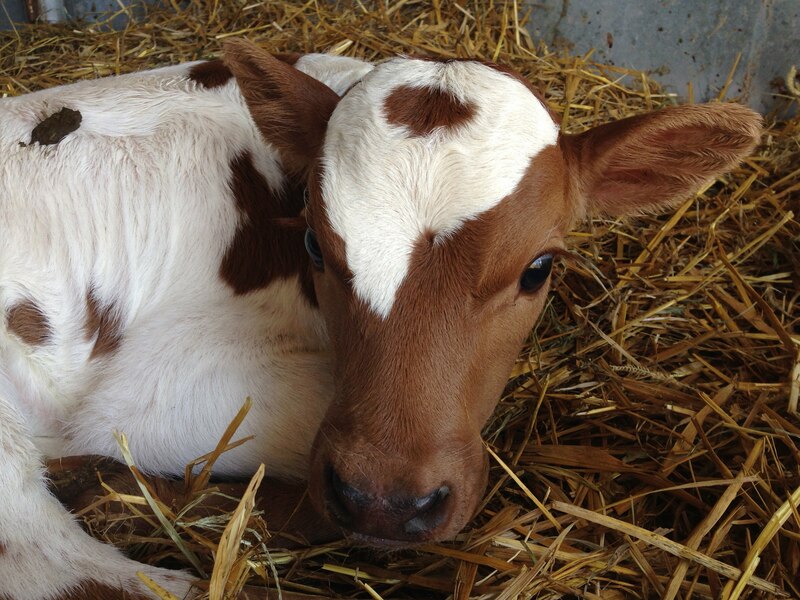 Each year, we brand our calves to have give that animal a permanent, traceable record of birth and ownership. 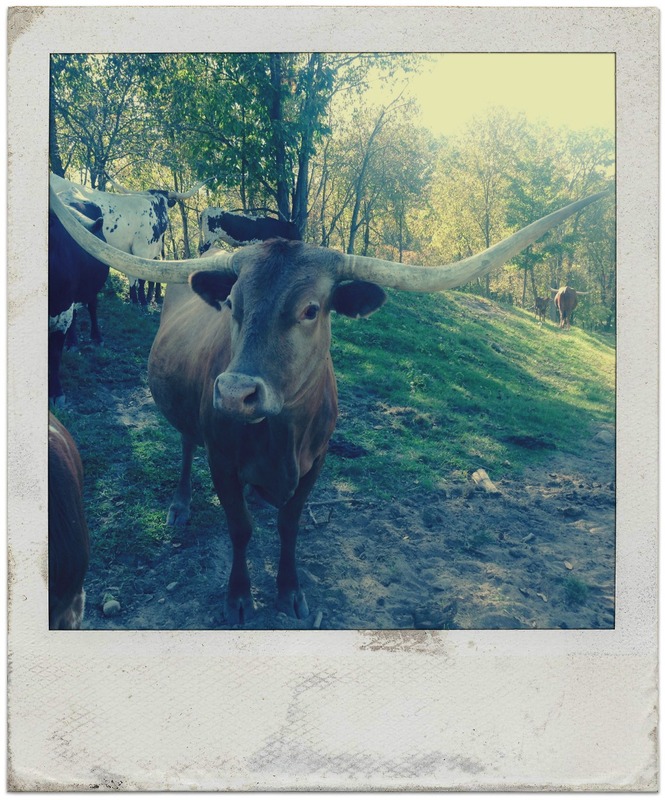 Genetics for longhorns are handled like genetics of any other registered animal. The ancestry of the animal can be traced back along lines, which allows buyers to search for specific offspring from specific animals in the hopes of adding those traits to their own program. You can see that on the actual brand, the arrow is quite rounded. Anywhere there is a pointed or sharp intersection is especially dangerous for the animal. The tip gets SUPER hot and could press sharply in, so we tried to minimize that as much as possible. 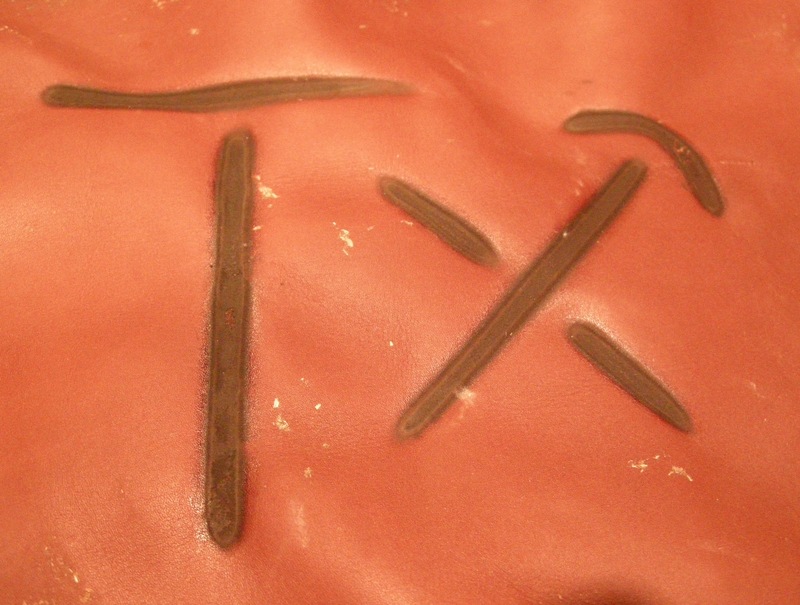 But that’s our brand: TX for Texas and then the NORTH is the arrow pointing up from the X as if from Texas to Michigan. Each animal is also given a number. Each breeder you meet will have a different numbering system that makes sense in their books. Some simply number the calves as they come through the chute. Our herd is small enough that we like to number them according to birth order. 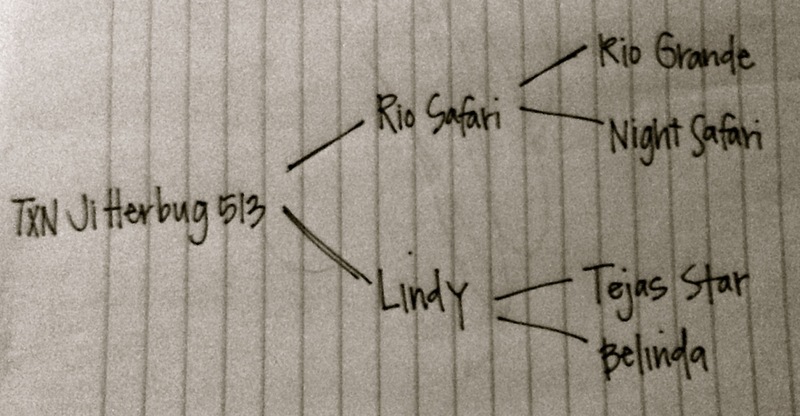 So, looking at Jitterbug here: she’s got her TXN brand and the number 513. This tells anyone that she was bred at TexasNorth and it tells us that she was the 5th calf of 2013. See? In a couple years, this will make it easy to tell at a glance how old she is. The branding process itself takes about 1 minute per animal. They are branded young, when they are fast healers and easier to handle. They simply walk into a squeeze chute that hold them tight and then rocks back so the animal is on its side, which helps keep it calm. 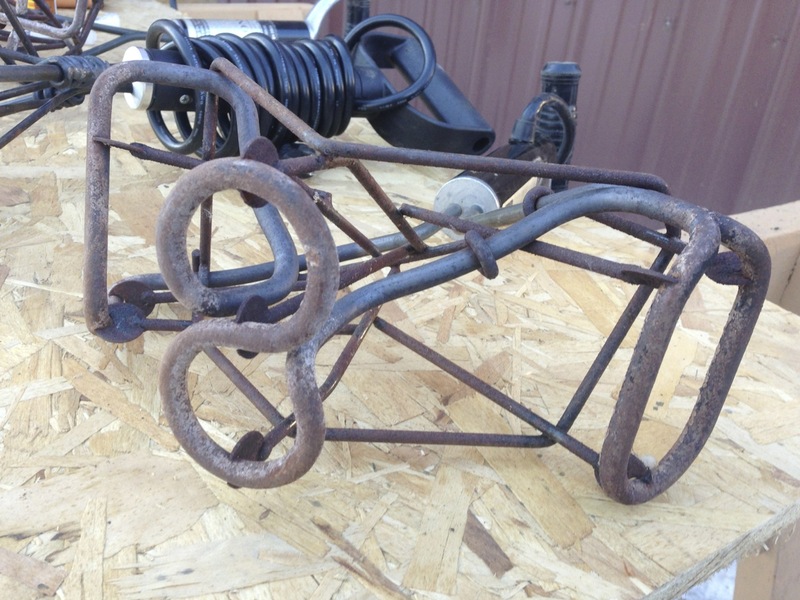 The branding iron is just a large version of your own curling iron. There are still old-fashioned, non-electric versions that you heat up in a fire, but this way is more consistent and safer for the cowboy and the animal: no constant re-heating, no uneven heat distribution, etc. The numbers are all on an iron, too- 3 irons, actually: 1, 2, 3 on one and then 4, 5, 6 on another and 7, 8, 0 on the last one. The number 9 is made by using the 6 upside down. Fancy, right? Once the calf is on its side, Curt pressed the TXN iron on first (which smokes because of the hair) and then alternates irons to get the right number on the animal. It helps to have a beautiful ranch manager nearby yelling out what number goes on which calf. Sometimes that sassy manager also holds the calf’s heads and tells them stories while the boys do their work. Sometimes she takes the kids for a walk when they get bored. Sometimes, they go get pizza. It depends. It’s not all boots and glory, I’ll tell ya that. 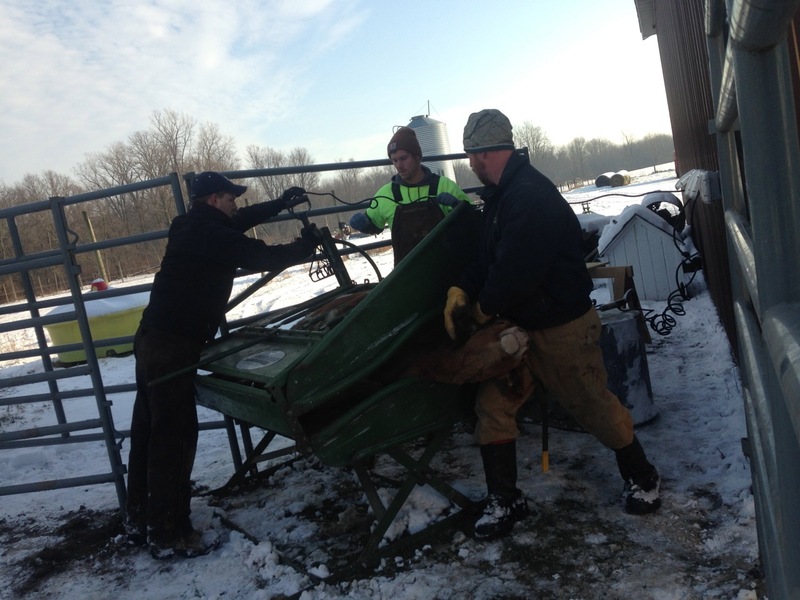 After the numbers are on, the chute is righted and the calf is released. It’s a quick, albeit uncomfortable (but not loud… our girls didn’t make a sound) process. The tattoo will scab after a week or two, but the girls are more stressed out by the whole traveling bit than the branding bit, and I’ve see grown men whine about their own tattoos more than these girls ever make noise about theirs. But, they do have some incredibly thick skin. We own our own branding iron, but we don’t have the number irons OR the fancy flip chute, so each year we load up our girls and we head over to a friend’s ranch for a “branding party.” Several folks usually show up with their calves, which makes the work easier to manage and absolutely a good time. Now, if there’s an buyer interested in Jitterbug, we could say, “Oh yes. She’s got fabulous potential. Lots of winners in her family lines.” The buyer could take us at our word, but before laying down serious cash would probably like some proof that she’s the real deal. Her certificate of registration, which follows her wherever she is sold, is stamped by the TLBAA once she’s branded and verifies her family tree. The sire, or bull in this case, is always listed on the top of the tree. 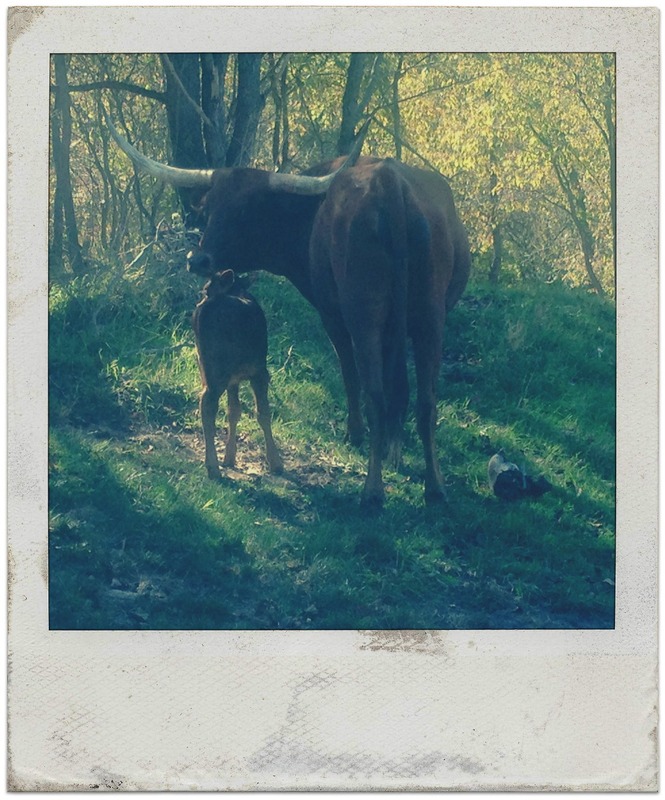 This is showing us that she’s got Rio Safari, Rio Grande, and Tejas Star in her blood, which is great news for horn growth, since Rio Grande (her granddad) is one of the longest bulls in the breed. 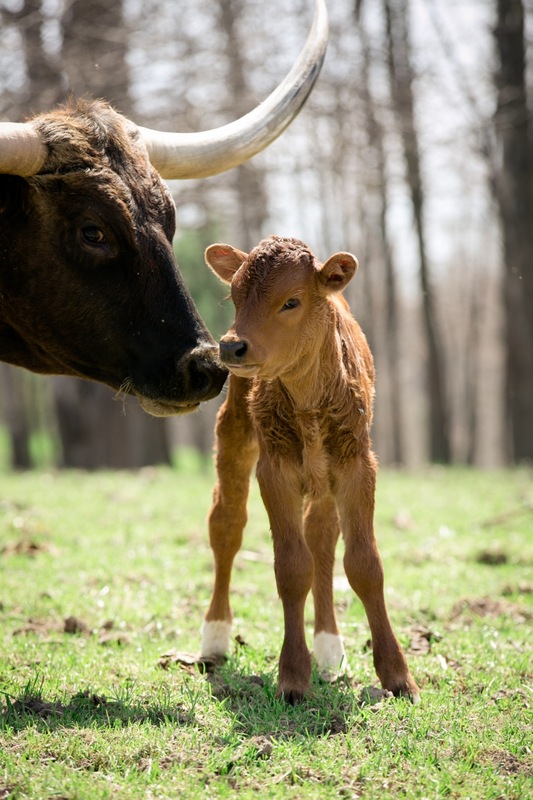 It also shows us that she’s a Belinda granddaughter (who we did not breed but do own… you know Belinda… she’s Sugar’s mom), which tells anyone that it’s likely Jitterbug is going to be a good milk-producer, an easy calver, and and all-around good mamma to her babies. Just what you want in a girl. We know all of this because every cow in that tree has a stamped registration card verifying their breeding lines. So that brand? That brand is symbol of our word and our program. It makes identification easy when the calf grows into a full cow and blends in more with the older herd. At the very least, it continues a visible tradition that goes back to the Egyptians. Thant, my friends, is a little bit about the other kind of branding. You should definitely invite everyone you know. After 7 years, let the record show that whether you mail invitations, facebook invitations, evite invitations, or stand on a street corner with a banner, 50 people will show up on your doorstep at 6pm. Invite everyone. You should have only one bathroom. That bathroom should both NOT LOCK and have 2 doors. One of those doors should be made of plywood that enters into the master bedroom. Keep it classy. Make your bed. You should forget to put out drinks. Remember the hotdogs and the sandwiches and the salty chips with dip, but forget the drinks until halfway through. You should host in a home with approximately 400 square feet of accessible inside space. Seven years has proven that the basement goes completely unused. Some people head straight to the bonfire out back and do not come back inside, using children to ferry drinks and food. Others claim the couch and still others the porches. It’s enough room. It is. It seems like it’s not, like it will never be enough, but people make themselves comfortable whether there is actual space or not. You should build a massive hay fort with 5-foot bales and secret passageways that encourage children to stay outside and makes new friends/fake enemies. Put the fort within easy viewing from the front window so moms can monitor any injuries without having to be away from the chocolate pecan pie. You should know that you’ll forget to eat. You know everyone who’s coming, so you’ll be hugging and laughing and smiling… and you’ll forget to eat. Plan ahead by making incredible friends who hide pies in your kitchen cupboards for you to find after everyone has left. You should have glow sticks. It gets dark out in the country, even with a full moon… so have glow sticks and candy apples for children. This will endear you to them and trick them into being visible and perhaps 1% safer. 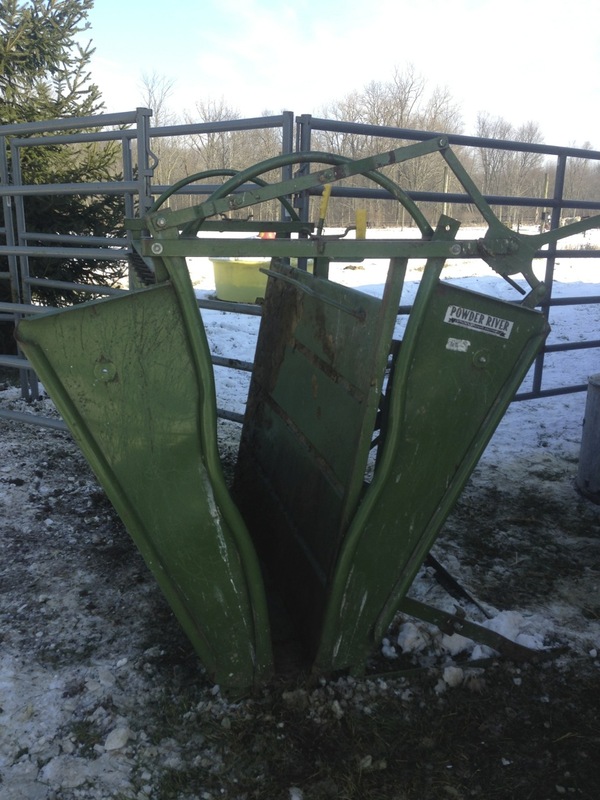 You should have a hay wagon that is excessively bumpy. The trail should have random tree branches to surprise people and very steep hills. People will think the tractor sounds “tough” and “vintage” and you will nod and say, “Yes. It’s fun, isn’t it?” all the while knowing it’s just in disrepair because you forgot to fix the muffler. Perspective, folks. Perspective. You should do it. Welcome them in with spotted windows and dirty floors, questionable forecasts and stuffy noses. Turn on the porch light and light the fire for new friends and old friends and the possibility of fellowship. Your sink will be dirty and someone will fall off the trampoline and yet another will miss the hayride all together, but there will be news of new babies, stories about grammas and moose, and the ease of friends making friends with other friends. You have good friends. Really good friends. And while this season of life does not allow for weekly dinners or sing-alongs anymore, studies have shown that people will come if you make them macaroni and cheese. They will. They will come even if it might be muddy, if the kids will go to bed late, if it’s 45 minutes out of their way, if it’s a full moon. Yesterday, I picked Rylie up from Sunday school and her teacher pulled me aside to let me know the earplugs we’ve been using are helping Ry feel more comfortable during the loud music time (amen and alleluia). Then, she asked if things were fine at home and I said, “Yes, actually. Things are fine. Right? I mean… are things fine?” She laughed and mentioned that Ry had been praying for 2 weeks now about the BABY COWS! and today she was very excited to share (something) about the BABY COWS! but the teacher wasn’t quite sure what story Ry was laying down (welcome to my world). Ah, yes. There’s a story there, I thought to myself. Remember? Rain was due to have her baby on the 19th? She did. 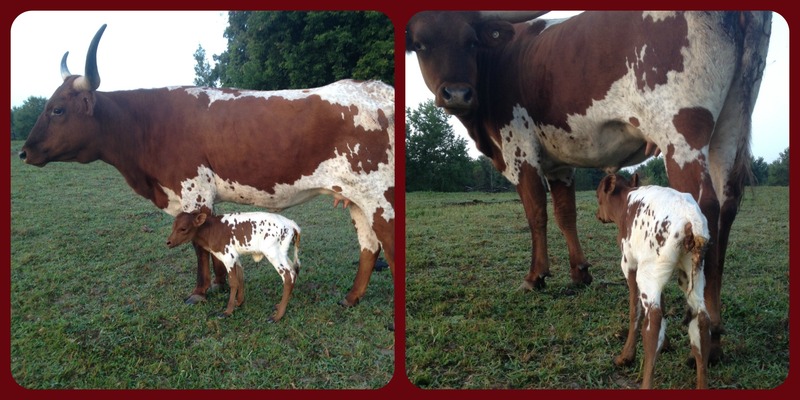 In the middle of thunder and lightening and a complete downpour, that sweet first-time mamma had a little boy calf. I found it immediately after I wrote that morning and mamma and baby were doing fine, despite the weather. The calf was walking… wobbly, but walking… and the skiies were clearing, so we dubbed him Lightening and went on with our day. That night, Curt walked out back and saw the two of them together again… wobbly, but walking and apparently nursing… so all was well. Until it wasn’t. The next morning, all the cows- including Mamma Rain- were up front and there was no Lightening. No big deal, we thought. It’s early and she’s young. She probably has him hidden. She’s a helicopter mom. But we didn’t see him later that day. Or even three days after that. I mentioned to Curt at dinner one night that I had a bad feeling and he agreed. A long search in the back 40 revealed… nothing. 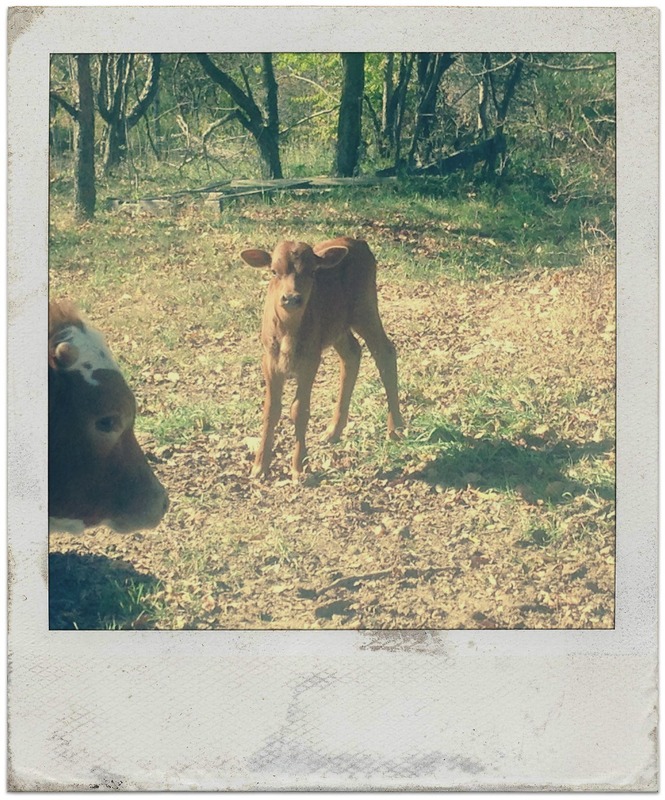 No calf, no signs of struggle, no anxious cows… nothing. We were sad. I mean, I saw him! We both saw him. And he was fine! What did I miss? And what could have happened? It was such a mystery… but there was simply no way to know. We finally told the kids that we weren’t sure, exactly, where Lightening was. He was hiding. And I think Ry knew that he was lost. So she, in her infinite awareness as a child who sees everything but cannot speak well, she had been praying. he Sunday school class had been praying. Wednesday, a sweet friend came to visit and we walked a little ways to see the cows… all up against the fence again… on display. And there was sweet little Tex right there in the back. It was Lightening. 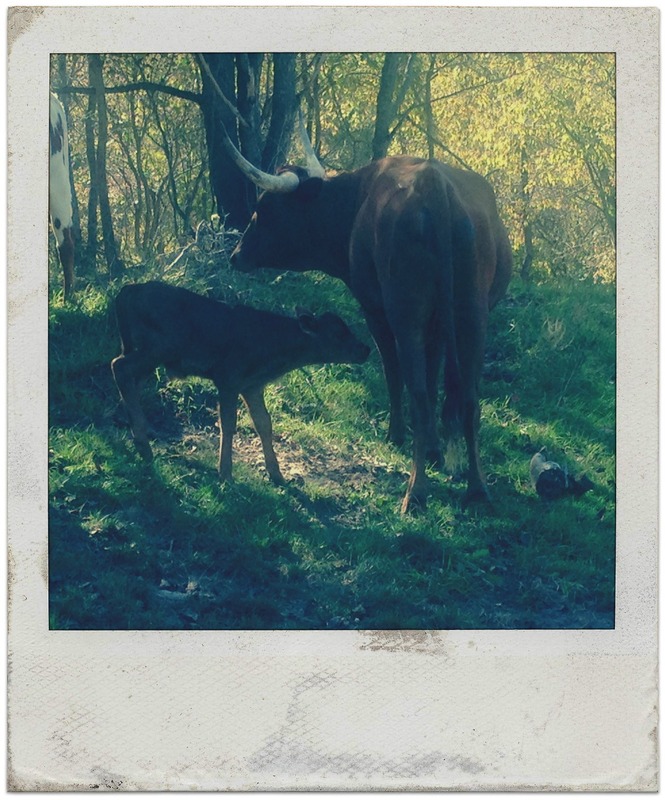 Sure enough… there was the tiny calf… a week later… completely fine and very shy. He popped up immediately, ran to Mamma Rain and the two of left left us to sweet talk the other cows. They walked quietly and very quickly with no ceremony or distress. Two days later, I found him again. This time, he gave me a good 10 minutes before retreating with his mamma… and since then he’s been sticking around a little longer each day. Mamma Rain giving us the eye. Mamma and baby making their way… away. I’d be lying if I said I didn’t get a little teary with amazement when I “found” him again that Wednesday. I guess he was never technically lost, but I was so afraid he’d been hurt or sick and I’d missed it. I’d not been there to help. 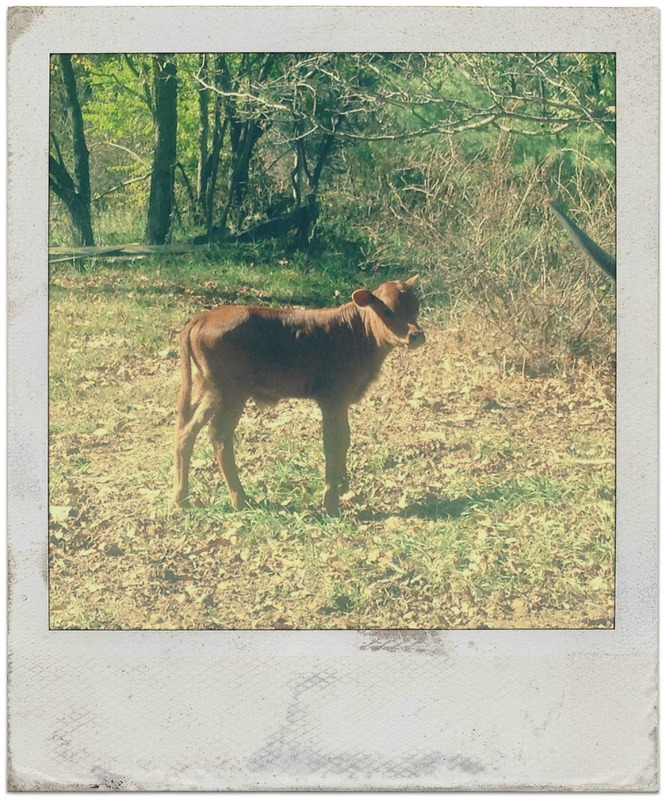 We’ve had our share of death on the farm… a calf born too soon, chickens losing against raccoons, and even our sweet cow dog Blue. It happens. It happens whether you’re ready or not, whether the baby looks fine or not, whether your brand new or have been farming for generations. But what sweet relief to see that baby… fine and strong and shy. A first time mamma with a little baby to take care of and 12 other mammas alongside her to help and guide and protect. She did just fine. She did it exactly right. Not like any of the others, but still exactly right. We were all thrilled. Rylie squealed and giggled and clapped… which I wish I had been free enough to do myself. I found life where I did not expect it, where I had counted all for loss. Anything, absolutely anything, is possible, friends.